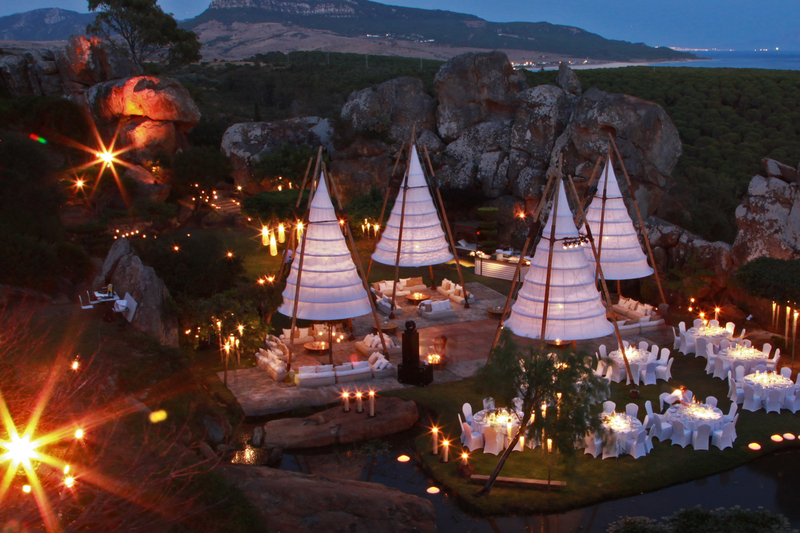 Love Garden is a garden which was created very much in keeping with the language of the senses. That is why it cannot be pigeonholed as belonging to any particular style. It was not designed by a landscape gardener nor does it follow prescribed rules. Instead, it has developed through intuition, inspired by the vision of re-creating its beauty following the devastation and loss of this beauty. Located on a mountain ridge right in the heart of the nature park at the Strait of Gibraltar, this Garden of Eden is surrounded by huge cyclopic stones, as if it were a prehistoric arena; it hides itself away, so to speak, in a secret place on the planet where – as if by an unseen hand – heaven and earth have entered into a harmonious bond in an intimate embrace. 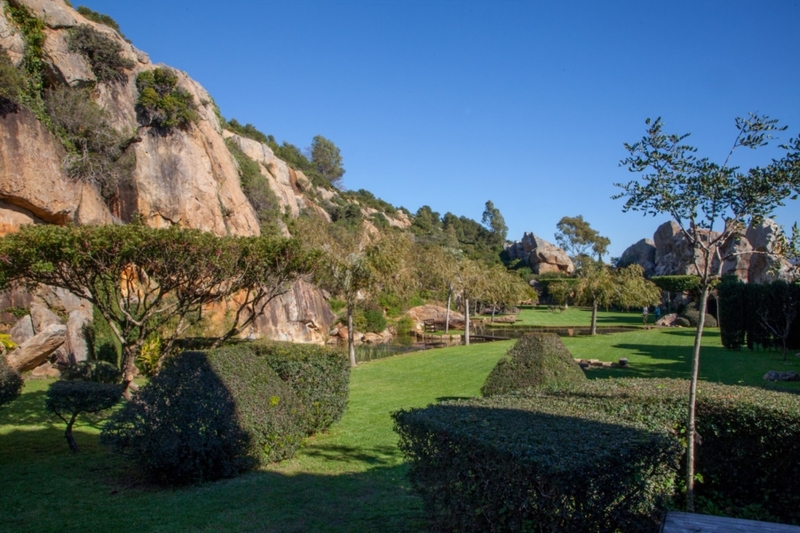 Visitors can admire and above all feel the way in which the all-pervading tranquillity communicates with the beauty of the greenery and with the power of the large rocks which surround this greenery in a mystical oval shape. Love Garden stands out as a unique place due to its strategic location and due to its being a sanctuary in memoriam, having become an alchemical stroke of fortune where lead turns into gold. Firstly it should be noted that the garden – which arose autodidactically through feeling and intuition – does not follow any particular pattern. Today, through the minuteness of its composition and as a result of its many years of care, we can observe a certain Japanese style – in the way some of its bushes and trees are trimmed, for instance, or in the decorative elements carved into the granite, in the large rocks, the lake with its small island, the balanced asymmetry (high and low ground) and the Zen atmosphere. Visitors enter the garden by way of three successive flights of steps surrounded by native bushes in hopeful green and magnificent stones covered in pure white lichens akin to a bridal veil. An oval area of 3,000 square metres reveals itself most unexpectedly and surprisingly on the third level. Thus, we enter the fresh, emerald-green stage where nature performs the great dance which is a celebration of life. The garden appears before us, divided in two by a lake in which the stones are reflected on sunny mornings and whose calm waters are lit up and made to sparkle by the stars and moon on dark nights. This small lake is fed throughout the year by iron-rich spring water, so that a rich variety of fauna and flora have settled there. Among its inhabitants are innumerable frogs, turtles and carp. The water plants include irises, rushes, papyrus and water lilies in white, pink and pale yellow. Five weeping willows standing along the edge of the shore in elegant melancholy provide the essential final touch to this idyllic scene. A short distance away from the shore, fruit trees blossom and develop to maturity, filling the air with scents and colours. In the middle of the lake we discover a small island with a bench at its centre. In order to get there, we cross an imaginary threshold – the border between the visible and the invisible, the tangible and the inexpressible. Thus can we pause and observe this beauty in the stillness, and allow ourselves to be guided into a parallel universe. In one place a circle of stones has been set into the ground and has the sole function of a fireplace. Here are the flames of remembering and forgetting, there those of peace, further along those of uncertainty or nirvana and right at the end, those of worry. Several natural sunshades formed by trimmed trees provide pleasant shadows which take us on a visual journey to an unreal place, to a kinder world full of fantasy which raises human inadequacy to a higher level. The garden is bordered to the south by Hercules-type rocks. The azure light penetrates through the gaps, the wind and sea breeze also playfully smuggling their way through. The eye is met by a fragmentary image of sea and sky, clouds and rain, summer haze and, in the winter, hoar frost. The exterior seeps into the interior, two languages speak to each other, two worlds merge with each other. A spring bubbles up in the upper part of this sheltered spot, the water of which tumbles into a natural fountain surrounded by imposing rock formations thousands of years old. A spectacular view can be had from here: the area where the Atlantic enters the Mediterranean, the Strait of Gibraltar. The city of Tangier and part of the north Moroccan coast are visible on a clear day – that’s how close we are to the culture and prospect of a whole continent: Africa. Love Garden is poetry made visible, transformation, daring, love…; it is, in fact, a therapeutic gift for the beholder, for the visitor, the friend, the doubter and for every tourist who has chanced to come here, who suddenly becomes a finder without having been a seeker. This paradise is a place where the intimate and extraordinary come together, the primordial and the exotic, the calmness of secrets and emotions, the whispering of the wind in the branches and the murmuring of the water. The garden is constantly developing, not only throughout the course of the seasons but also because we are adding further areas, restoring woods and creating forms which lead us to a peaceful whole. An advance contact it recommended.